Diana Dyer, MS, RD: More happiness! Inaugural Ann Arbor Lady Food Bloggers afternoon potluck picnic becomes a night out! "Cultivate your life - you are what you grow - inch by inch, row by row"
I'm a wife, mom, long-time organic gardener and now a new organic farmer, Registered Dietitian (RD), author of the book A Dietitian's Cancer Story and website CancerRD.com. In between all that and more, I am a multiple-time cancer survivor. My website focuses on nutrition information for cancer survivors, however I began this blog in June 2007 to share a wider scope of my thoughts about life as a cancer survivor, food and nutrition, growing food, recipes, our environment, and the urgent need for developing food systems that promote health not disease, ecological sustainability, and social justice. In January 2009, I began my blog "365DaysOfKale" to write about my passion for "all things kale" and the CancerVictoryGardens™ blog in March 2009 to help everyone touched by cancer cultivate health through a garden's nourishment of body and soul. Follow our farm's updates on our farm website, Facebook, and Instagram. you must have the quiet. "I hope you love birds, too. It saves going to heaven." Personally autographed copies of the most recent printing are available at Nicola's Books in Ann Arbor, MI (734-662-0600, nicolasbooks.com). Proceeds are donated to research funded by The American Institute for Cancer Research (aicr.org, 1-800-843-8114). All material on this blog is for informational purposes only. Please consult your personal physician and health care team for advice that pertains specifically to you. The author of this blog disclaims any liability arising directly or indirectly from the use of the information on the blog. More happiness! 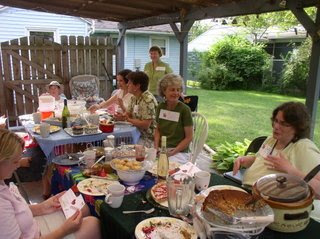 Inaugural Ann Arbor Lady Food Bloggers afternoon potluck picnic becomes a night out! No, we didn't actually spend the night, but we all stayed much later than we had planned. Many of us went out of curiosity because we had met either Kim or Patti (who had the brainstorm for this gathering and organized the picnic), knowing that we would not know anyone else, for the food of course, as it was sure to be great!, a desire to meet others who were passionate about great tasting food and cooking plus passionate about sharing those loves through writing, but maybe even with some trepidation as some bloggers find keyboard communication easier than face-to-face contact. I think most of us told our husbands that we would easily be home by 7pm or so, but we finally were leaving (and only very reluctantly) well after 9 pm with a deep sense of friendship, a desire to meet again, and satisfying sense of community. I have heard that those who were unable to come feel they missed "an event" (and they did! ), and all of us are eagerly looking forward to the next time we gather face-to-face. In the meantime, I'll bet our paths cross while food shopping, either at a Farmers' Market, local grocery store, U-pick farm, or at a food class somewhere. It will be great fun to try to quickly match a name with a face with a voice with a blog. There was so much good food that I can hardly remember it all. Where was my camera???? I do remember two foods I had not seen before, both of which I am going to try to make at home and will let you know how they turn out: fried sage leaves (Kim) and kale chips (Victoria). Both were out of this world yummy and seem easy enough to make. This is not to slight everything else that was brought by any means, just to say that I was on sensory overload with all these new faces and names, conversations going a mile a minute in every direction, and seemingly endless amounts of unusual and scrumptious food. I have added a new section to the left of my postings that lists the blogs for the Ann Arbor Lady Food Bloggers. They are all different. You're sure to find one that you just love. The first one I found was The Farmers' Marketer. Kim's photos are beautiful and her writing warms my soul. Now I am enjoying getting to know the other Ann Arbor Lady Food Bloggers by sampling sections of their writing. I know that I now have far more blogs on my "RSS feed" than I can ever read in a day, but I will enjoy popping in to read each on a periodic basis. I'll bet your community also has numerous people blogging about food and your community. I encourage you to find them and share their passion. Please feel free to let me know what food blogs you read on a regular basis. I grabbed this one photo of our group at the top of my post from Patti's blog Teacher in the Hood. I have seen other photos of the Lady Food Bloggers and the food they brought with recipes on some of the other blogs. I hope that is an incentive for you to start exploring the Ann Arbor community's Lady Food Bloggers and even an invitation to start your own blog! At the end of this gathering, I suddenly found myself simply wishing I could be the fly on the fence, observing, listening, and simply soaking in all the warmth and positive energy that was moving throughout the yard. It was an evening to remember. I felt a deep sense of both honor and gratefulness for all the aspects of my life (including those jarring speed bumps that always seem to be hit when life is on the fast track) that led to the opportunity to be invited to this picnic with this amazing group of women who are trying to change the world, one meal at a time. Be hopeful, be healthy, be happy! Diana, thank you for the beautiful post and sentiments. I am so glad that you came! For me, the idea of cooking local sprung from my anti-corporation mindset. I hate the idea that those CEOs and all them are getting rich off of crappy food. It's my way of "sticking it to the Man!" :) :) Seriously, I would MUCH rather my money go to a local businessperson or farmer...I inherently trust them so much more. Diana - what a beautiful post. One thing that was key for me in changing how I eat had to do with nutrition and the fact that everything on our closed loop planet is connected. The increasingly accepted idea that depleted soils produce depleted food produce depleted people has been very motivational to me to find a better way. I know I have been very glad to learn more from you about food connections and health! that was a beautiful post and I will have to think about the many things that brought me back to mindful, ummmm, food. So sorry to leave question here which seems not suitable. I really don't know where i should post my question, so sorry. I just have one question. I get to know from some books that taking selenium, saccharomyces cerevisiae, and wheat seedling on daily basis is very good to cancer patients. But i somewhat doubt the effect of such health-care products. Could you pls tell me if it's really good for my mom to take the three kinds of tablet or powder to fight cancer? In China here we can buy American brand like Vitamin World,Puritan's Pride, is this two brand reliable? or is there any other American brand which you could suggest that i can trust and buy for mom? many many thanks! I'm looking forward to your reply. I would suggest reading about and considering the incorporation of many aspects of Traditional Chinese Medicine into your mother's comprehensive approach to fighting her cancer, specifically the use of Chinese herbs, acupuncture, diet, and Qi gong rather than looking for American vitamins. I have not been to China, but it is my understanding that there are several cancer treatment centers that do incorporate both Western medicine (chemotherapy and radiation therapy) with traditional Chinese healing therapies. Look for a doctor with a degree in Oriental Medicine (ODM) who has extensive experience with breast cancer as a reasonable place to start for recommendations for your mother. Various traditional therapies can be individualized to your mother's short term and long term goals for treating the cancer, preventing or minimizing side effects of conventional therapy, and recovery of her strength and spirit after her treatments are completed and she continues on to wellness. I admit that I feel my comments are akin to "bringing coal to Newcastle", an English phrase that means bringing resources or sharing information to an area where it is already abundant or well appreciated. Really thank you for your kind words and suggestions. Thanks you for giving me all this information. I understand what you mean. I should resort to other more scientific way like TCM to incorporate into my mom's comprehensive treatment rather than relying on those health-care products. Thank you for telling me that TCM website which is so helpful for me. Many thanks for your help and blessing. May you happy everyday!